Mixing engineers and producers generally have a bunch of internal metaphors for visualising or handling the various aspects of a song mix, depending on what they’re working on and their own personal preferences. Some stick with the same ones all the time, but most dynamically shift between a selection of metaphors as they go. It can be a way of keeping certain mix “rules” or approaches in play when building up a song mix. For example, some “see” a mix as a picture or painting, with each part made up of different colours and shapes. “Make the bass more blue”. Whatever that means. Others think in food metaphors – “we need more spice on the organ” (sounds painful to be honest), the “vocal isn’t sweet enough”, or “it’s still too sickly – it needs some salt in there” etc. It even works the other way around – while beer-tasting I can’t help comparing the flavour to the spectrum of frequencies in a mix. “There’s not enough low-mids in this IPA”. Personally, when mixing I switch between the colours and shapes, the flavour and others as well. For example, I’ve always felt the the mix as being composed of horizontal and vertical aspects, especially when dealing with anything primarily groove-based. 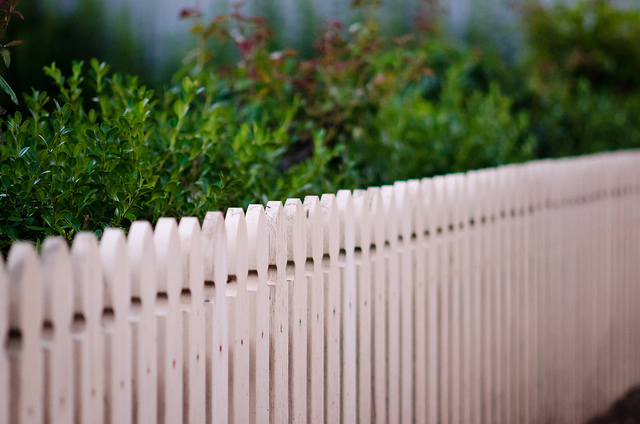 One day as I was trying to explain it to someone, I jokingly referred to it as the “picket fence and shrubbery” metaphor. It does make it very easy to visualise and compare the vertical (pickets) transient aspects – for example drums and fast intricate glitchy stuff, with horizontal aspects (shrubbery)- eg pads, basslines, vocals etc. It becomes more about timing and note length. Is the picket fence too large compared with the shrubbery behind it, or is the shrubbery overgrown and concealing the picket fence? Obviously it depends on the song, but it’s easy to “feel” the balance between the two elements and hopefully help achieve an appropriate balance. If there’s too much shrubbery, the mix could be washy and rhythmically undefined, whereas if there’s too much picket fence, the drummer was probably helping mix. Boom boom. Music could be considered to be made up of parts that often have both transitory and sustained components to the sound. Transitory parts (ie shorter than approx 50mS) could be considered to be “vertical” whilst sustained elements (longer than 100mS) could be viewed as “horizontal”. Most instruments have a combination of both – for example a piano or acoustic guitar could be mixed to feature either a predominance of the attack or sustain portion of the envelope, contributing differently to the mix in either case. Visualisation of a mix with these horizontal and vertical attributes in mind could help a mix engineer ascertain whether there is an appropriate balance of the two aspects depending on the context of the music. For example, in dance music where the rhythm is important, it might be beneficial to feature more of the attack portion of the sound, while in something more musically ambient, more longitudinal features could be highlighted, perhaps even adding reverberation to enhance the effect. (Note that in dance music, it is common to apply a side-chain to impart more vertical impetus to a horizontal sound – eg using the kick to side-chain the string pad for example). The key point is that almost any sound can be treated to expose more of the attack or sustain portion, and the collective treatment of various parts in the mix with this approach in mind could see completely different mixes created from the same material, even with similar peak levels for each part. In this light, it is simply the controlling of the balance between RMS or average level compared with the peak levels for each part. In mixing drums, for example, this vertical vs horizontal viewpoint can be effective in order to help decide on an optimum balance between close-mic’ed drums (eg the snare) and the often-well-compressed overheads. It can also make things simpler while adjusting the attack on a compressor in order to provide an effective balance between the attack and release components of a sound.